As Logan and Hawkeye search for Mysterio, Neo-Hydra has a plan to test out the villain’s usefulness in Dead Man Logan #2, by writer Ed Brisson, artist Mike Henderson, colorist Nolan Woodard, and letterer Cory Petit. This one keeps up the pitch perfect characterization that Brisson has made his stock in trade, while also moving the plot forward. Neo-Hydra tests out Mysterio’s powers, using his illusions to make prisoners look like superheroes and killing them. Meanwhile, Logan and Hawkeye keep fighting their way through villain bars, trying to get info. Miss Sinister chides Sin and Crossbones for their small thinking and Crossbones threatens Mysterio if he tries to use his illusions on them. Logan gets a call from call Glob and him and Hawkeye head back to the X-Mansion, where Forge shows them Maestro’s time machine and reveals he can send Logan back to the Wasteland at any time he chooses. Logan decides to keep hunting Mysterio and him and Hawkeye get a break in the case. Racing to Time Square, they confront and Mysterio and Taskmaster, but things aren’t as they seem. One of the joys of this book so far has been Brisson’s characterization. He gets each character and their motivation and uses them perfectly. Logan is determined to make sure no version of his future happens, no matter what the cost. Hawkeye acts a stalwart friend and the perfect comic relief. 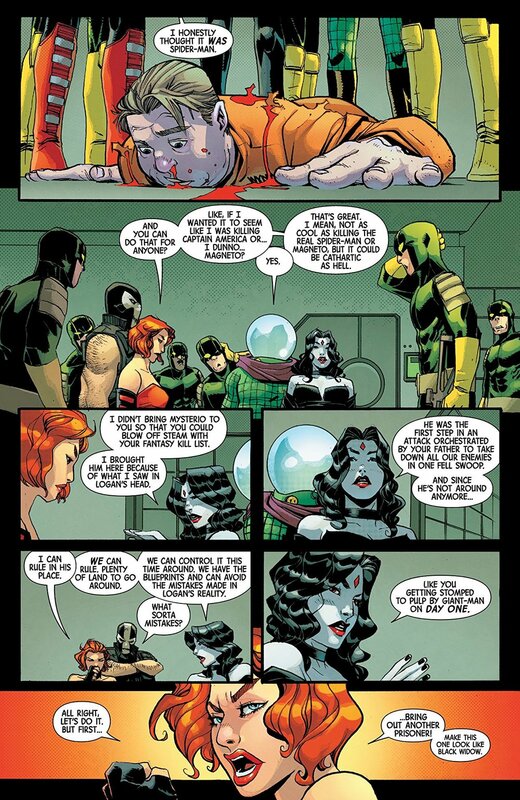 Sin, unlike her father the Red Skull, thinks too small and doesn’t understand how to use an asset like Mysterio. Crossbones is a bully, but an effective one. Miss Sinister is true to her namesake, scheming and working to keep the whole caper going. Mysterio is in over his head, but also secretly reveling in his newfound importance. Brisson has proven himself a master of getting into character’s heads and using what’s there to progress the plot. A lot of writers like to make characters their own, changing how they act to fit a story. Brisson doesn’t do that and it makes the book he writes that much better. It’s an old school approach to storytelling and it pays dividends. Beyond the characterization, this book is embarrassment of riches. Having Hawkeye around keeps things light, which in a story with stakes like this is much needed. A lot of characters get some good jokes off, but it doesn’t really distract from the tone of the book and helps make the whole thing more palatable for the reader. This book so far is like a mirror to Mark Millar and Steve McNiven’s original Old Man Logan, but instead of that book’s unending nihilism, this one presents itself as serious while also knowing that it’s okay to throw in some good quips and keeps the reader entertained on more than one level. Mike Henderson and Nolan Woodard’s art is perfect for this book. Henderson’s pencils are detailed and fluid with just a hint of cartooniness. It helps sell the humor, but it also makes the action scenes work well. Woodard’s colors give the whole thing a nice pop. It will be interesting to see how the art team progresses, but so far they strike the perfect balance for this story. Dead Man Logan #2 keeps the quality of the first issue going. It’s only two issues in and anything can happen after this, but Brisson, Henderson, Woodard, and Petit are crafting a perfect Wolverine story and a fitting swan song for a character that has been the star of one of the best books Marvel has been putting out for the last three years. The cliffhanger ending of this one will keep readers coming back, but if they aren’t already sold on this book, that’s their loss.